We set off today not knowing exactly where we were going to stay, but our target was the Bolado Park Event Center 160 miles away between Hollister and Pinnacles National Park. It sounds fancy but it's a fairgrounds that has camping. The Pinnacles campground only had a few nights of availability, so we decided on more of a sure thing about 20 miles away. Plus the Pinnacles dump station is closed and has been for some time, and Bolado has full hook-up sites for a dollar less than the National Park campground. Pinnacles National Park has a west and an east entrance, however, the roads don't meet so you can't drive all the way through. That makes the logistics of visiting both sides a bit more complicated. And we didn't know which side to camp near. But we had to have our mail and our mail-in ballots from Florida sent somewhere, so we just picked a spot. We'll do a lot of driving in the Jeep while exploring Pinnacles and the Big Sur area. About ten minutes from the fairgrounds, I called to make sure they had spots. They did, but the nice lady said "Just stop by the office on your way in and bring your driver's license, vehicle registration, and proof of insurance. That'll make it quicker." Well allrighty then. In all our years on the road, we've never needed to provide so much information. But we had it all and obliged. The lady, who shall remain nameless, made copies of our documents while I read through four pages of rules, disclosures, and disclaimers and signed three separate papers. She kept apologizing that she had to have all that stuff, "But we're run by the state and have to have it." I just laughed and said "Welcome to California! ", and she responded "Exactly." She assigned us a full hook-up site as far from the office as we could get, and we're the only one on our row in Site 29. It's a bit dusty and the flies are bad because of the livestock they have here from time to time, but it's quiet, fenced, and gated. The gate is locked every night, and they gave us a key just in case we're out and get back late. Linda backed in and we stick out in the dirt/gravel road a little, but there is plenty of room to get around us and they aren't expecting anyone else as of now. We hooked up to the 30-amp electric (they have a couple 50-amp sites) and the water. For the sewer, we had to dig through dirt and leaves to find it in the back of the site, and we had to use two hoses to get to it. Plus it's uphill. I debated whether or not it was worth it to use my macerator pump, but decided against it. The nightly rate is $35 which is great in this area for full hook-ups. 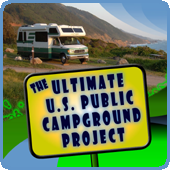 Most of the RV parks are $50 - $75, and the coastal state parks are $35 with no hook-ups. We'll stay here through the weekend and then re-evaluate on Monday. 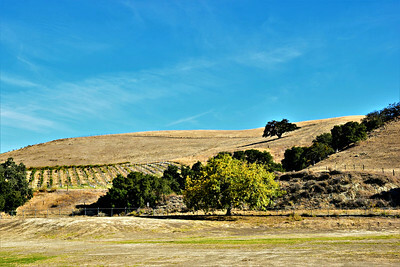 We're in a valley with hills to our front and back, and in front of us is a farm with horses and cows and a vineyard. It should be relatively quiet and it's a decent spot to spend the weekend. Tomorrow, we're driving over to the coast and we'll see what unfolds after we pick up our mail. 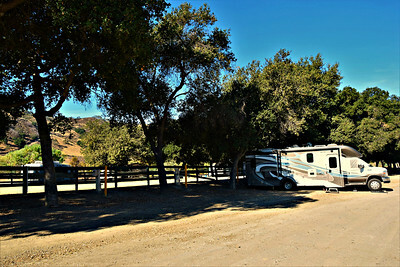 We camped at 6 California campgrounds this summer - both public and private - and none of them required any paperwork. What was up with the one you camped at? David, I have no idea. We ve had to do the same paperwork at the fairgrounds in Golden, Colorado so not just a California thing. We stayed at Pinnacle NN last April with our grandkids for a week and loved it. They enjoyed seeing the condors and the caves. Big Sur is amazing! Enjoy! I am thinking there are a lot less regulations here in Alabama than in California. Fine with me. Love seeing your California pics after a few months in the east's heat and humidity. We stayed in a private park in Southern California where they wanted all that paperwork, and they copied it all and make a hard file with my name on it in a large file cabinet! I was shocked and have never had another park ask for half of that stuff!! I'm glad to be catching up with your posts, I don't know why it wasn't updating on my blog roll. Safe travels!! Hey Jodee, the URL for the Journal has changed. The old http://www. doesn't work anymore. 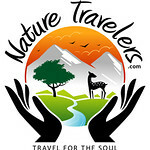 Now you have to use https://rv-dreams.typepad.com/, so you might have to update your blog roll. Also, we've recently changed the service that provides posts through email and RSS. Updating should have you seeing all the posts again.